The Clean Plate Club: Epicurious Farmers' Market Tour! w/ Chef Ben Knack! 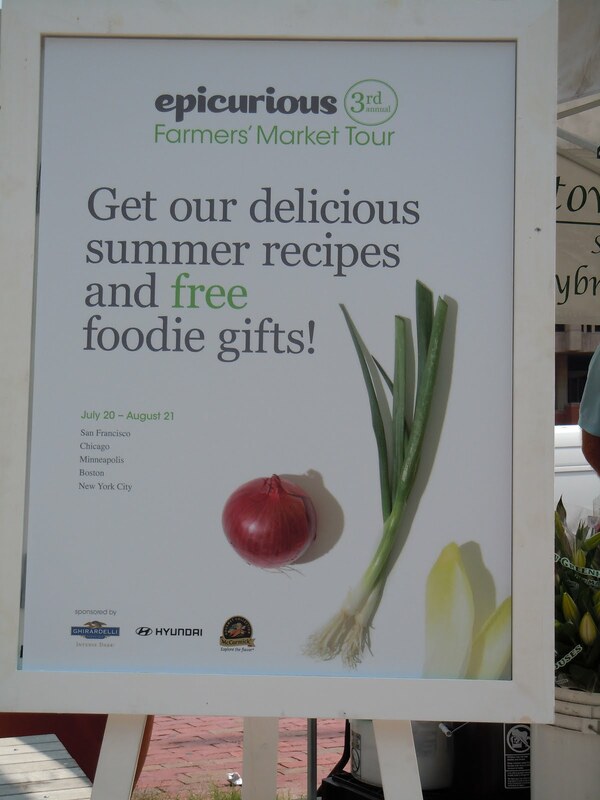 Epicurious Farmers' Market Tour! w/ Chef Ben Knack! One of the things I really love about blogging is how it connects me with other foodies in Boston and beyond. Ever since Michelle and I realized that we work in the same neighborhood, we've hit up the Scooper Bowl, the Clover Food Truck and Foumami!! No better way to spend a workday lunch than with a fellow foodie! Monday she alerted me to a chef demo at the Government Square farmers market. I wasn't too busy around lunchtime, so it was the perfect event on a hot day! 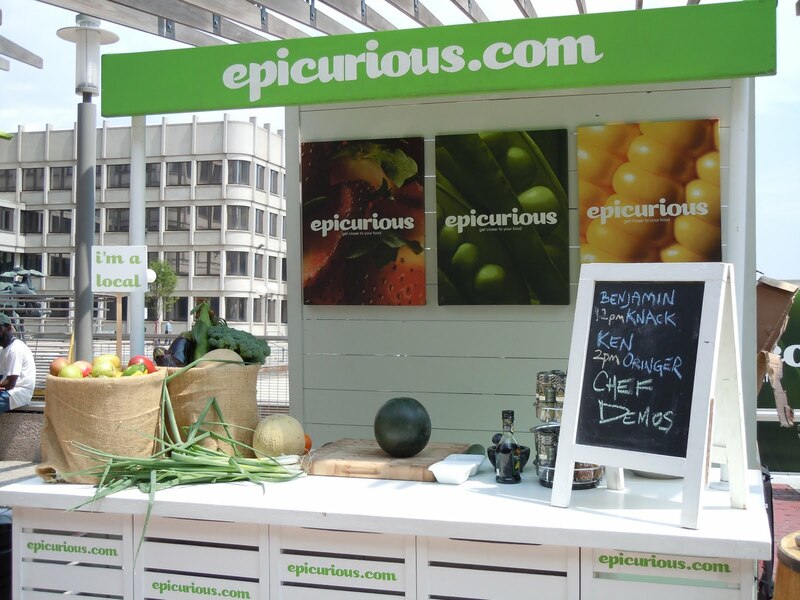 The event was hosted by epicurious - they had a cute booth set up at the market as part of a nationwide tour of farmers markets. 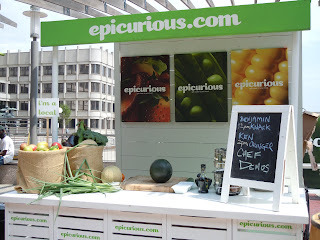 Anyone who knows me - or reads this blog for that matter - knows that I LOVE epicurious. Its a great 1-stop shop for recipes from some of my favorite publications like Bon Apetit and the late, great Gourmet magazine. It's a great resource for foodies. 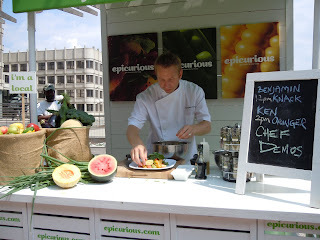 The demo was hosted by a local chef, Benjamin Knack. 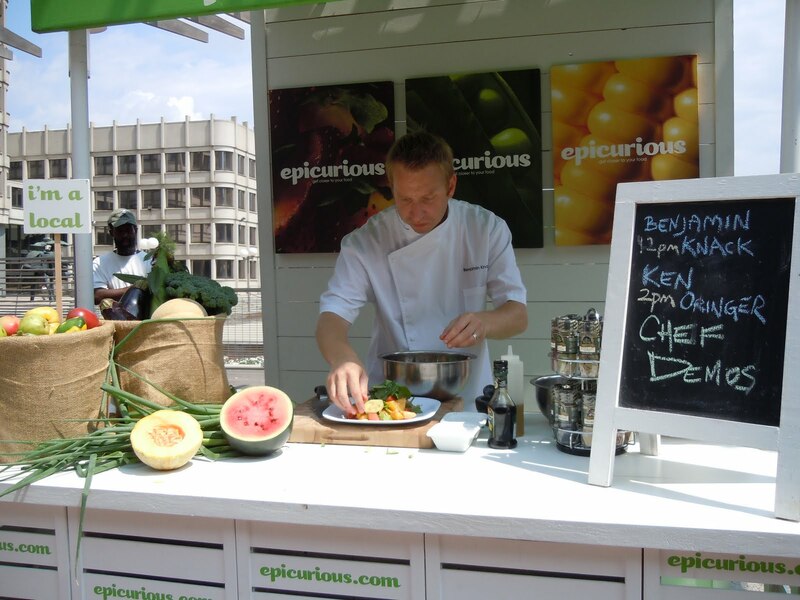 You may recognize him from his recent stint on Hell's Kitchen, or from his work at Sel de la Terre in the waterfront. 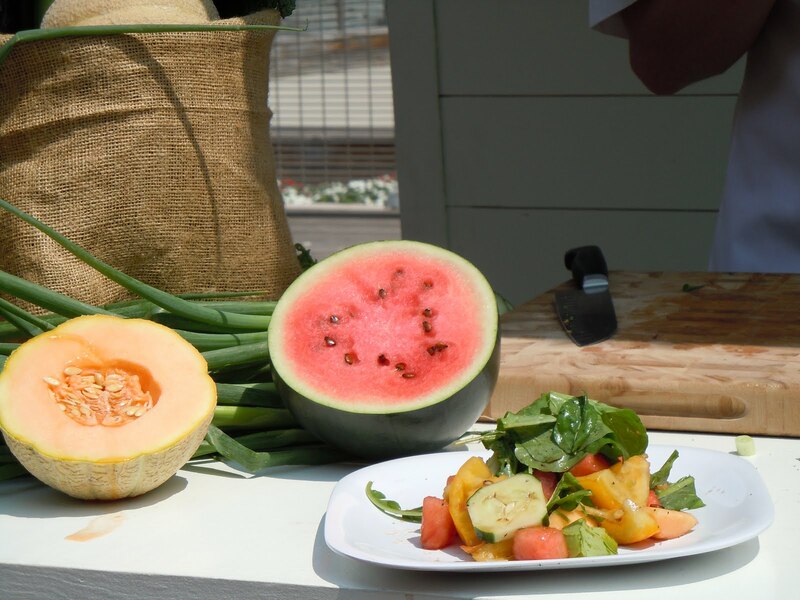 Chef Knack featured a very creative yet simple salad recipe featuring fresh produce that he had acquired that morning at the farmers market. He combined sweet melon, with refreshing cucumber, heirloom tomato, scallion and spicy arugula into a colorful and beautiful salad. He dressed it simply with balsamic vinegar, olive oil, salt and pepper. Doesn't that look yummy? It's making me hungry all over again! After the presentation Chef Knack stuck around to answer questions and talk to fans. He was so NICE! We talked for a bit about how much we love the markets, cooking with fresh, local ingredients....and he let us be super-foodie-nerds and snap a picture for our blogs! I sheepishly admitted to the chef that I've never been to his restaurant....Michelle and I have plans for a foodie lunch at Sel de la Terre sometime this fall! And make sure you get to the farmers markets around Boston - They are at their peak of fresh produce right now!!! I love having our foodie lunch excursions! I'm also looking forward to seeing you tonight! 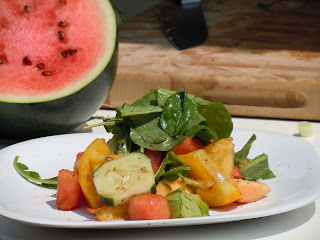 Thanks for the compliment on the pictures - the produce was so beautiful I think it was impossible to get a bad photo! We did not get to taste-test but I am certainly going to make my way over to Sel de la Terre as soon as Chef Knack is back at his post!! this looks like SO much fun! i love farmer's markets + demos. xo! That salad looks so good!!! You definitely have to check out Se de la Terre. Never been to the waterfront one but I've been to the other two. it's really good!